ASTRA belongs to Department of Structure Analysis of the Institute of Physics ASCR (FZU) widely recognized through the structure analysis software JANA it developed and maintains, and for its training activities in a form of so-called ad hoc workshops. For more than twenty years, ASTRA has been providing worldwide services of advanced crystal structure analysis of almost any kind of crystalline materials except proteins. The ASTRA team also develops electron diffraction tomography and dynamic refinement of crystal structures from electron diffraction data. The latter method is the only way for determination of accurate atomic structures of nanocrystals. ASTRA currently runs three laboratories with total throughput of about 500 samples per year. The in-house computing tools JANA2006 and SUPERFLIP have over 2000 users worldwide and 250 yearly citations. The latest tool DYNGO for dynamical refinement of crystal structures, which has been finished last year in its first version, has already found external users and we expect it will quickly spread within the community. Three basic diffraction methods illustrated with help of Ewald sphere and reciprocal crystal lattice. The diffraction occurs when a point of the reciprocal lattice meets the surface of the Ewald sphere. Diffraction with single crystal requires sample rotation in order to bring maximum of the reciprocal lattice points to the surface of the Ewald sphere. Diffraction with powder sample can be done without sample rotation because each grain possesses a randomly oriented crystal lattice. Electron diffraction requires sample rotation. Ewald sphere is very large due to short wavelength of the electrons. Therefore multiple diffraction of many reciprocal lattice points is highly probable. In order to minimize multiple diffraction the incoming electron beam makes a precession movement. 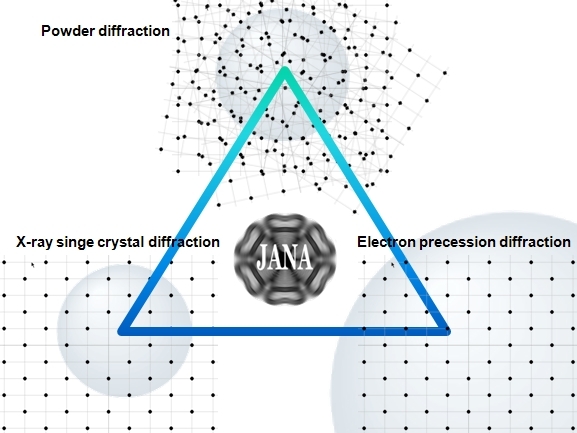 The logo of the JANA in the centre symbolizes unified processing of all the mentioned kinds of diffraction data by this program.